Our 5000K corn bulb is 13.3" long, 5" in diameter. and has an E39 large mogul base( about 1.5" ). If use it in an enclosed fixture, like wall packs, canopy, parking lot shoebox fixture, street light, etc. Make sure the Min. lamp compartment dimensions are 18" * 10" * 10". What's an LED Corn Light bulb? The LED Corn light bulbs are the future of LED technology. Certified by UL & DLC, High performance, low power consumption, and long lifespan make these the best choice for LED bulbs. Adapts to fit 150W-600W traditional Metal Halide Bulbs, HID, CFL, and HPS. Able to retrofit to nearly any application, such as industrial spaces lighting, garage, warehouse, parking lot, factory, street lighting, and other locations striving to reduce their carbon footprint. Our corn bulbs are available in colors with 4000K, 5000K, 5700K. Save money on energy and on bulbs! Able to replace metal halide bulb, HID, HPS, CFL used in garage, warehouse, barn, patio, post light, hospital, hotel, industrial lighting, gas station, etc. Anywhere need to retrofit Replacements. ● The input voltage and lamps should be matched(AC100V-227V). BEST CHOICE: 5 Years Warranty, Replacing 400W to 600W Metal Halide HPS/HID bulbs replacement, 1000W incandescent or 400W CFL equivalent. Cut down your electricity bill by up to 82%. 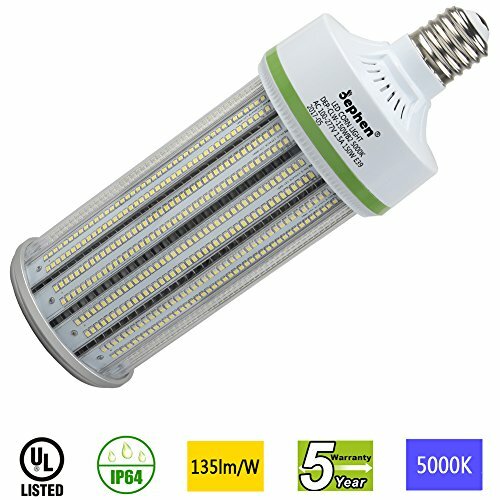 Excellent Performance: Our LED garage corn bulb delivers 20250 lumens of 5000K bright clear lighting and project light in a 360 degree fashion. Great luminous efficiency with low power consumption. EASY INSTALLATION: Connect directly into Large E39 Bases - just screw in, Fits many different fixtures to replace traditional lamps. (If there is a ballast in the existing fixture, simply disconnect or bypass when installing the corn bulb). Certified: Our corn LED bulb have been certified by UL(E483965), CE and RoHs certification. So they meet the necessary safety and reliability standards and better quality.